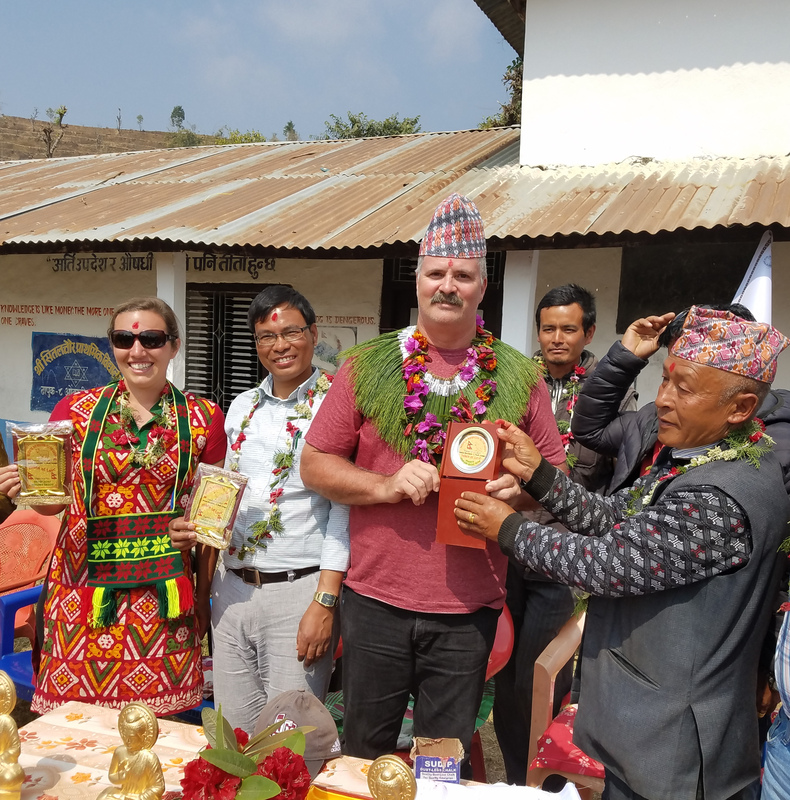 Dr. David Fernandez, agricultural extension livestock specialist and interim dean of graduate studies and continuing education at the University of Arkansas at Pine Bluff, recently volunteered with Winrock International as part of the USAID Farmer to Farmer program in southwestern Nepal. There, he helped local goat farmers optimize their production practices. Despite increases in production, the farmers haven’t always been able to earn more money, he said. Many of them did not know how to breed goats appropriately for hardiness. Over the course of the program, Fernandez emphasized the importance of developing a good record-keeping system and implementing a rotational breeding system. These measures will help reduce inbreeding and ensure larger, healthier offspring for sale. Fernandez said goats in Nepal are susceptible to many of the same parasites found in Arkansas. He recommended the farmers use the FAMACHA method (which relies on selecting only certain goats for treatment based on the degree of anemia in their mucous membranes) to detect internal parasites such as barber pole worms for more effective treatment and to select goats that are resistant to these parasites. Because barber pole worms are increasingly resistant to dewormers, he also recommended that the farmers plant Sericea lespedeza — a flowering plant native to Nepal — in their pastures. The plant will repair the highly eroded ground on the farms and provide a nutritious feed that can help reduce the prevalence of barber pole worms. Will Hehemann is a writer/editor at the University of Arkansas at Pine Bluff. A version of this article was originally published on the UAPB website. It is a bittersweet post today, as we wrap up 5+ years of inspiring and impactful work with Farmer-to-Farmer in Bangladesh, Nepal, and Myanmar. In these five years, Winrock volunteers have completed 313 volunteer trips and donated over 6,300 days of time to train and assist 19,184 farmers, teachers, extension agents, entrepreneurs, and youth. This work has resulted in new and improved training and degree programs, increased access to nutritious foods, improved livelihoods, and stronger agriculture sector leaders. And it has built bridges and lasting relationships across borders. I have seen and heard the impacts on the ground myself, during site visits and focus groups over the last several years. I met livestock farmers in Bangladesh who improved their animal husbandry practices and are now earning more income – which helps them feed their families. I talked with teachers at schools in Bangladesh and Nepal who are newly empowered and now implementing improved pedagogical techniques in their classrooms, to better motivate and prepare students for careers in the agriculture sector. 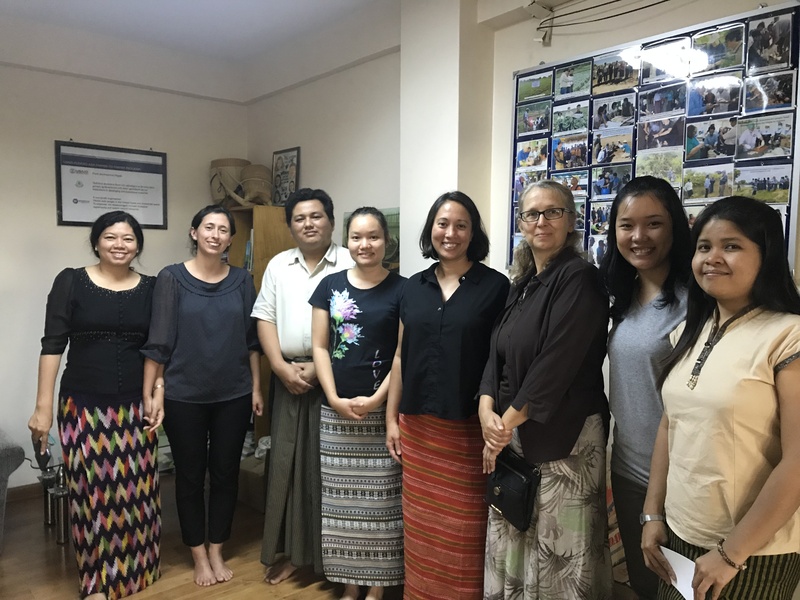 I listened to the aspirations of women and youth in Bangladesh and Myanmar who are now starting new businesses after participating in Farmer-to-Farmer training. And I sat in the homes of Myanmar farmers who are proud to have started to grow – and in some cases, export – high quality agricultural products, previously unaware of the income generating potential of these crops. In all cases, those who participated in Farmer-to-Farmer training have become leaders within their organizations and communities and are sharing information with others. 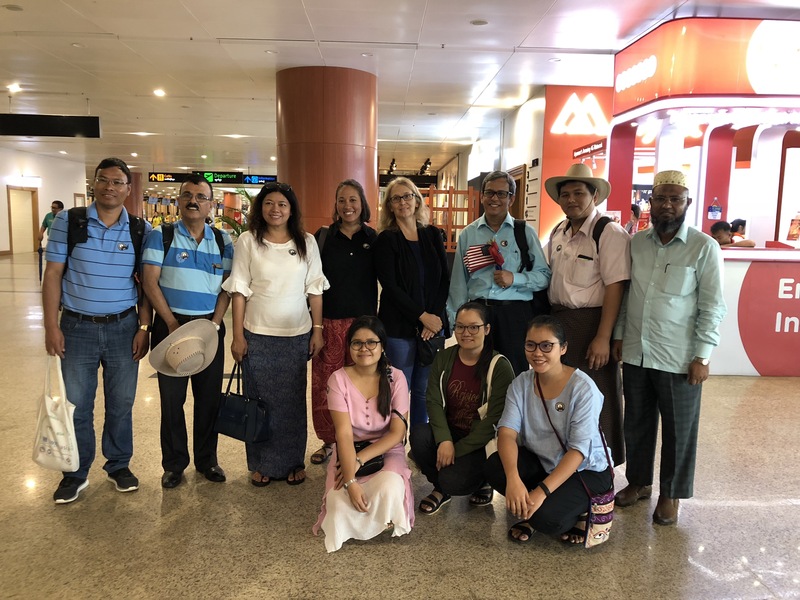 Likewise, I continue to hear how the American volunteers continue to stay in touch with their host organizations and take their Asia Farmer-to-Farmer experiences back to their jobs, community work, and families. Both sides are forever changed, and the ripple effect – on both continents – continues to grow. 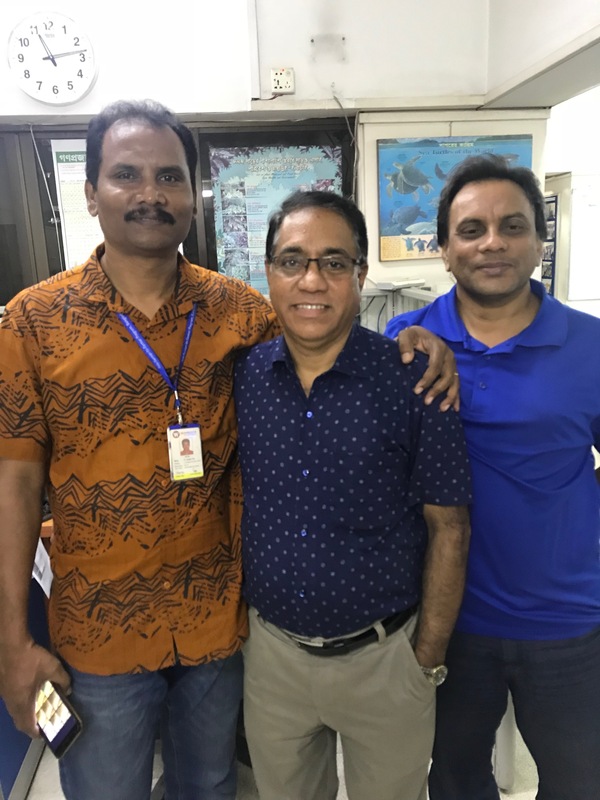 Winrock’s Asia Farmer-to-Farmer team has worked tirelessly over the last five years to identify on-the-ground needs, design and implement volunteer assignments, and ensure that our volunteers are well equipped and safe throughout the duration of their work in country. Over the years, we have shared many memories with our staff and volunteers and will truly miss implementing the program in this beautiful region of the world. We are so grateful to our Asia F2F field staff and to all of our wonderful Asia F2F volunteers! Thank you, from the bottom of our hearts, for all that you have done and all that we know you will continue to do. It has been a pleasure and an honor to work together. We will miss these smiling faces! 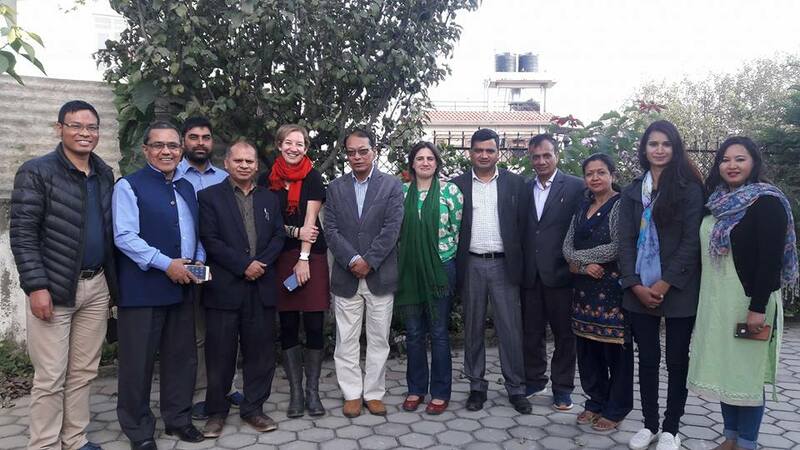 We were fortunate to spend two weeks in Nepal working with Professor Binayak Rajbhandri and HICAST University, helping them to enhance their Masters in Agribusiness curriculum that will help develop entrepreneurship skills in their students. We were both drawn to the program due to our collective experiences in entrepreneurship, higher education, and agribusiness. Over the two weeks, we met with HICAST students, faculty, and staff as well as local business leaders to discover the gaps in the current curriculum and make recommendations on new courses and content that would help to develop a spirit of entrepreneurship within the institution and student body. Through the assistance of Winrock staff, Chhan Bhattachan and Dr. Vrigu Duwadi, we were able to speak with several students within the program to hear their opinions and discover ways they thought the program could be more applicable to the real-world business environment and not solely on theory delivered via textbook and lecture. Since most students work full time and appreciate the idea of applied learning their feedback was helpful in understanding the gaps in the current curriculum. 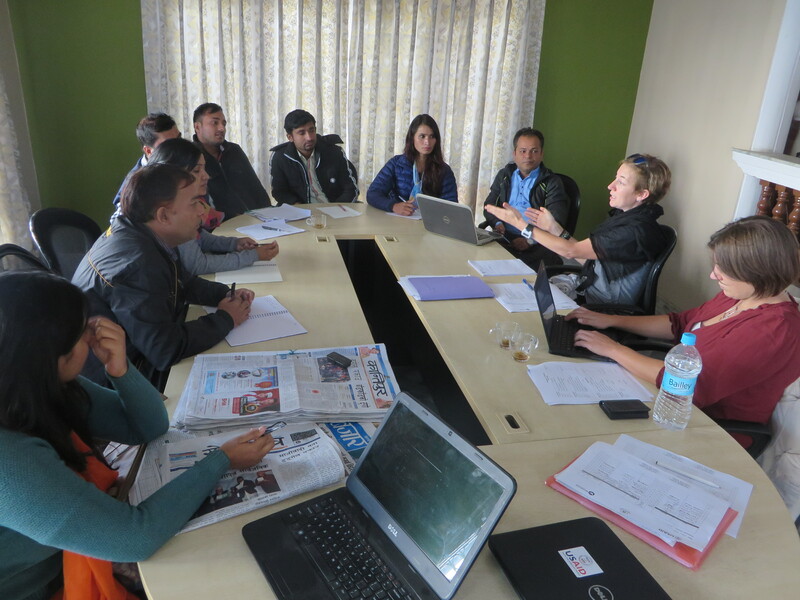 We were also lucky to meet with members of Kathmandu’s agribusiness community to better understand the knowledge and skills students traditionally lack when entering the workforce. Business owners believe that graduates lack real-world experience and struggle to convert the theories they learn in school to the applications needed in the workplace. They want to see graduates come out with more real-world experience and applicable knowledge. Lastly, we met with several members of the HICAST faculty to comprehend the courses they taught as well as the delivery method of the content. We learned that faculty in Nepal universities are not full time, rather they work in full-time jobs and often teach classes on the side. As a result, they rarely have time to make curriculum changes, spend time on paperwork or facilitate educational opportunities outside the classroom. These time constraints pose a considerable barrier to implementing a more robust curriculum dependent on experiential learning, which we deemed necessary to create a more entrepreneurial system. We presented our findings to the HICAST leadership during a lively discussion. We acknowledged that some of our recommendations could be implemented immediately and that some would involve a much “bigger lift”, including cultural change and a new way of doing things throughout the institution. On the more immediate side, we recommended focusing on class discussion, using real-world case studies, and including current technology in the classroom. We also suggested including course content such as leadership, creativity, value chain analysis and a regional business environment class. All of which would help to develop the critical thinking skills that are necessary for an entrepreneur. On the longer-term side, we recommended the creation of two applied to learn courses, one that would involve students creating and running their own businesses and one that would involve students solving real business issues for real clients. Since Nepal is a relatively risk adverse country when it comes to business, we hope that our recommendations can help students become more comfortable with risk and consider starting their own businesses. At the center of economic development in any country is the development of new business which creates jobs and in turn puts more money back into the local economy. For the right individual, Nepal has a lot of entrepreneurial opportunity within the agribusiness industry. We hope that our recommendations can help HICAST develop a curriculum that gives students the skills and confidence to create their own business which will contribute to the development of Nepal’s economy. 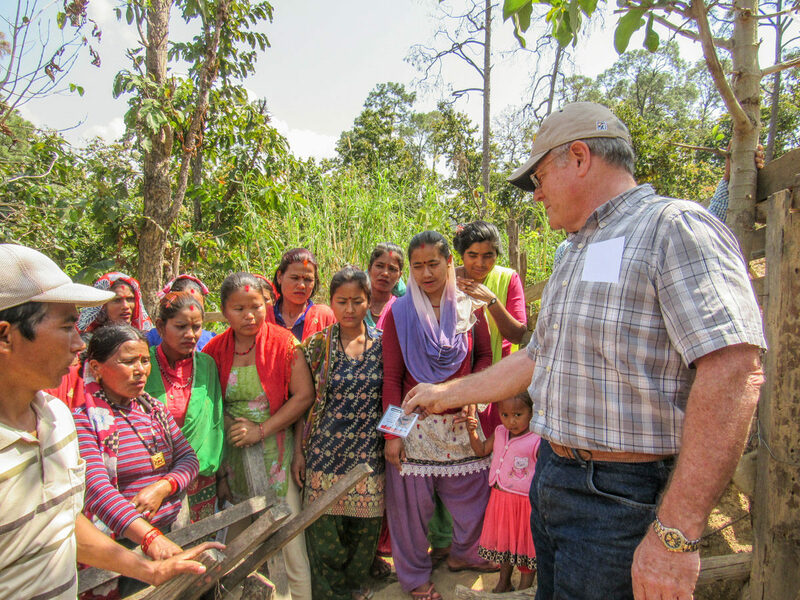 Our Nepal Farmer-to-Farmer staff have nominated, Dr. William (Bill) Foxworth, as the November Volunteer of the Month, because he is a “highly skillful, flexible volunteer and adjusted his hands-on training sessions for the assignment to best utilize locally available equipment and resources in Nepal.” Dr. Foxworth is the reproductive physiologist at the International Goat Research Center at Texas A&M University and is responsible for Artificial Insemination (AI) training at the center. He has also worked extensively in reproductive technology transfer in Africa and Latin America for both cattle and goats for more than 25 years. During his assignment, he conducted training for Okadi Goat Raising Group members, local service providers, and extension workers on AI technologies and practices to improve a youth-targeted goat breeding program. Sushil, one of training participants and Government of Nepal Extension Officer explained, “F2F volunteer William’s contribution is crucial for the country’s context in goat breeding and increased production.” After the training, Sushil facilitated AI in more than 150 goats, doubling the conception rate from their AI operations. Bill shares his thoughts below about his Farmer-to-Farmer experience. As a research scientist, my goal has been to develop technologies that assist with livestock reproduction. Improvement in breeding technology leads to more efficient animal production and greater number of offspring. This is a foundation for feeding more people worldwide and that is my true aim. 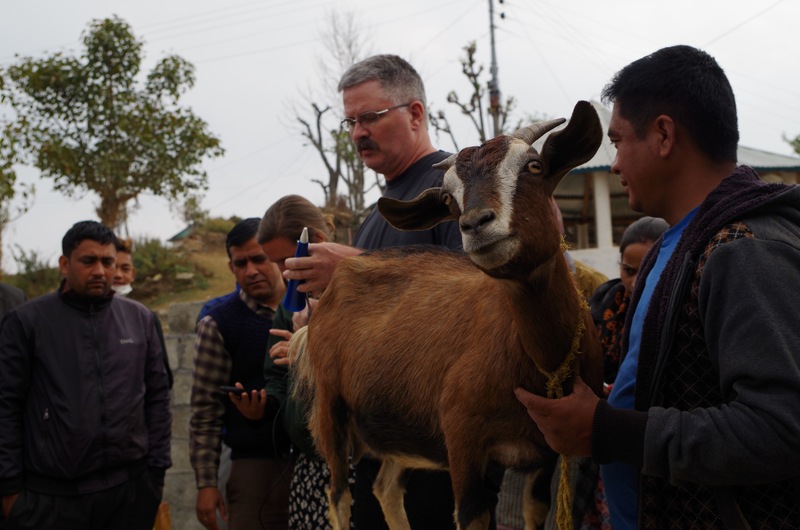 Volunteering in Nepal afforded me the opportunity to enhance the knowledge base in goat reproduction in a country that relies so heavily on the goat. For me, the highlight was generating the discussion of how to disseminate this reproduction technology in a manner that would best benefit the people of Nepal. Winrock’s infrastructure made the trip work seamlessly. Every step of the way was meticulously planned out with some flexibility and that allowed me to focus on giving my presentations and training sessions. It also allowed me to delve more deeply into the culture through the in country representatives, making my presentations better because I had intimate insight into my audience. I have had the opportunity to work all over the world and each country I work in presents a new set of challenges from culture to infrastructure. Nepal presented me with a view of a country, that while being smaller in size and geographically highly varied, was a crossroads for several cultures and religions. Seeing their efforts to deal with their differences gives me insight into my own multicultural world and, hopefully, I impart it to my students, colleagues, friends, and family. Enjoy your time. Utilize the in country experts to understand the people and cultures. Ask lots of questions. This will help you tailor your presentations and maximize the benefits to the audience. Working in Nepal, with the lack of some infrastructure and the availability of certain products, reminded me of the need to be flexible and resourceful. After returning, I was reinvigorated to work on and develop strategies for transferring agriculture technologies in global locations that may not have all of the energy or product availability that we have. It is a truly rewarding experience. For me, having the opportunity to help people improve their ability to produce food and provide better foodstuffs to their fellow man, allows me to directly contribute to helping put food on someone’s plate. How do you feel about the support from Winrock, whether before, during or after your assignments? The staff, both here in the US and in Nepal, were of great help. I have a pretty hectic schedule every day and they took care of all the travel and logistics allowing me to focus my preparations on my presentations. Not speaking the language, I had some trepidation, but the staff in Nepal, and a well placed Peace Corp volunteer, made my communications flawless with the local communities. I must say, one of the unsung heroes in my time in Nepal was my driver. We were frequently on some white knuckle roads and his skill at maneuvering the mountainside allowed me to relax and enjoy the view. Dr. Foxworth with Peace Corps volunteer, Garland Mason. The first question almost everyone asks is, “How cold was it?” Everyone imagines that Nepal is all like the base camp on Mt. Everest. They don’t realize that geographically it goes from low tropical jungle to the highest point in the world. The temperatures in the areas where we were working, Pokhara and Waling, were very pleasant in March. I will admit, while looking over the edge of some of the roads on which we were driving, I felt like I was on the side of Mt. Everest. I am a research scientist at the International Goat Research Center, Prairie View A&M University, Prairie View, Texas. I conduct research with goats in an effort to improve their reproductive efficiency, with an end goal of disseminating the information to limited resource farmers around the world. Does anyone in your life play a role in supporting your involvement? In providing inspiration? My family supports me by giving me the time to pursue my goals of helping others around the world. They cover my responsibilities at home while I am gone and I am eternally grateful for that. I am in touch by e-mail on occasion, but I am in regular communication by Facebook. Nothing makes me happier than seeing a post about people doing something related to the training we did. My family is of blended cultures and I have had the opportunity to be educated in Japan and work in Africa, Europe, and Latin America. Each time I encounter a different culture, it reminds me that we are a diverse people. Working with individuals in Nepal offered me first hand insight to the unique cultures in Nepal and they added greatly to my understanding of the world, especially in a country that serves as a crossroad to many cultures. This experience also offered me insight into my own work and how best to present my knowledge in a manner that could serve this unique community. 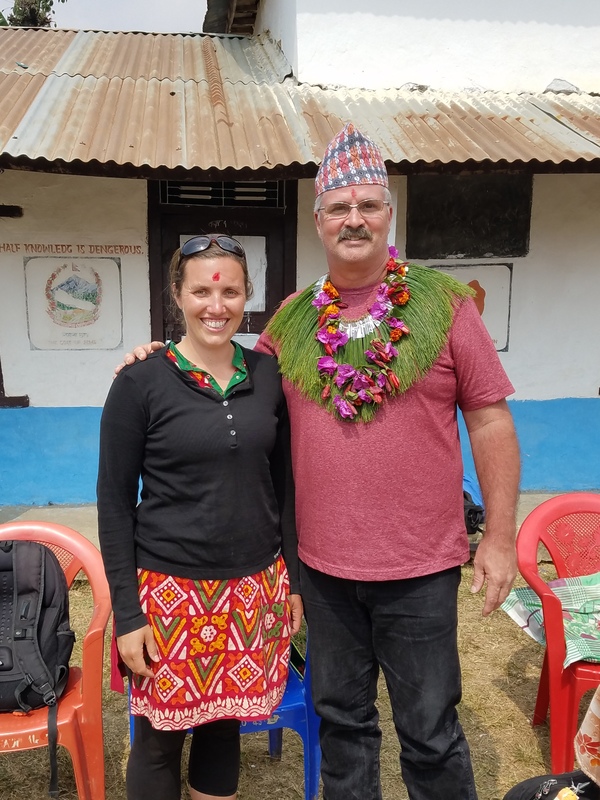 You can read more about Dr. Foxworth’s volunteer assignment and Farmer-to-Farmer’s cooperation with Peace Corps in Nepal in this previous blog post. Closing ceremony after Dr. Foxworth’s trainings. My volunteer assignment was to conduct trainings on Increased Safe Tomato Production through Integrated Pest Management (IPM). 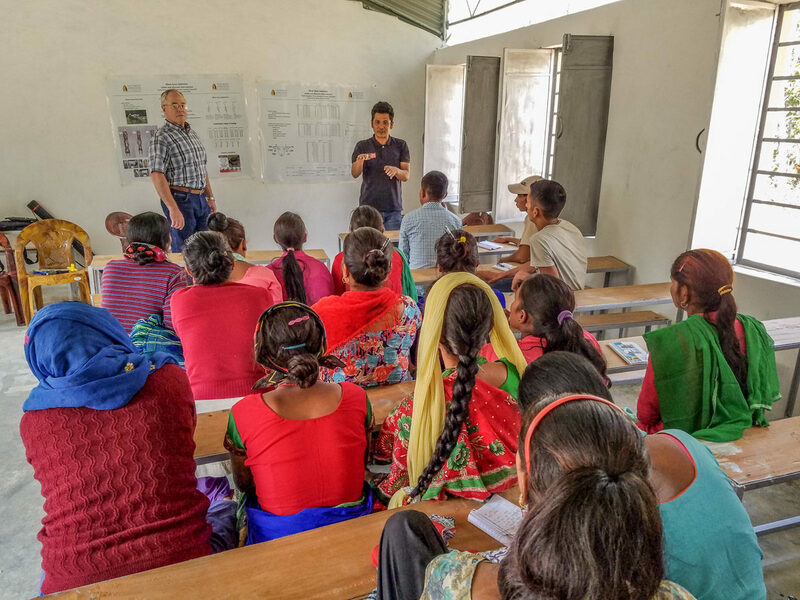 The training sessions were held in four village development committees (VDCs) in the Kaski region of Nepal, outside the city of Pokhara. The host organization was Dhikurpokhari Community Development Organization (DCDO). 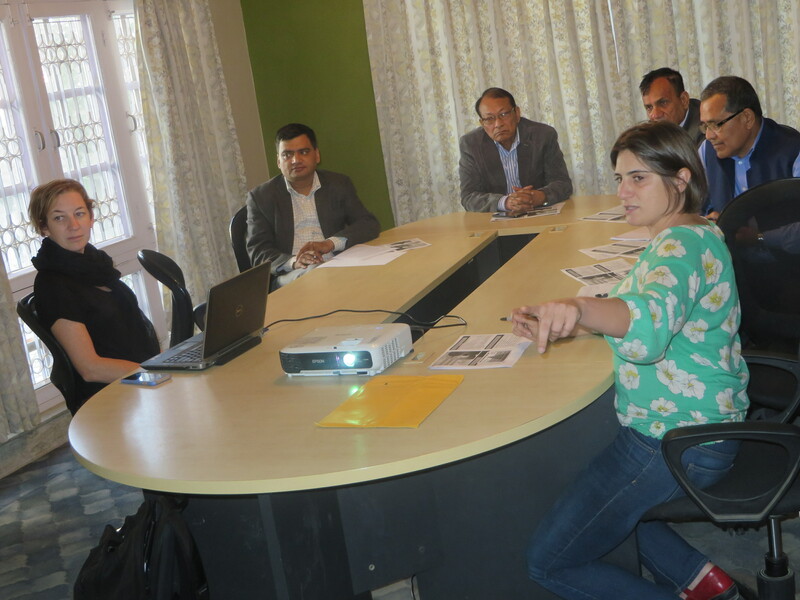 We conducted a 2-day training session in each VDC. I flew into Kathmandu, Nepal and was met at the airport by Arun Thapa from the Winrock Nepal F2F team. I was extremely grateful that I did not have to drive in Nepal. I was very thankful to have a Winrock driver and jeep! Kathmandu is a bustling city, the roads are windy and full of motorcycles, cows, dogs, cars, and trucks. There are no traffic lights or lanes that I could see and drivers bear to the left and the driver’s side is on the right, something I had a challenging time adapting to! I then met with Winrock F2F Nepal Director Vrigu Duwadi at the Katmandu Winrock office. Vrigu gave me an overview of Nepali culture; the Namaste greeting, the food staple: Dahl baht (dahl and rice, which I loved) and logistics for the assignment. 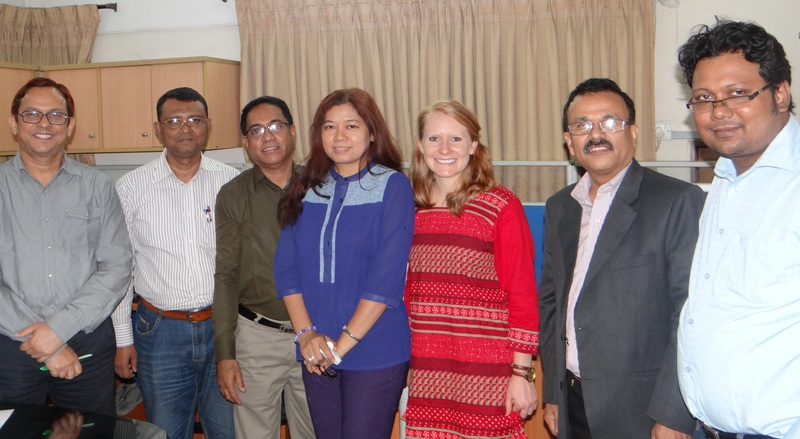 I also met with the International Development Enterprises (iDE) team in Kathmandu, who have been developing vegetable IPM packages for Nepal with the IPM Innovation Lab at Virginia Tech. 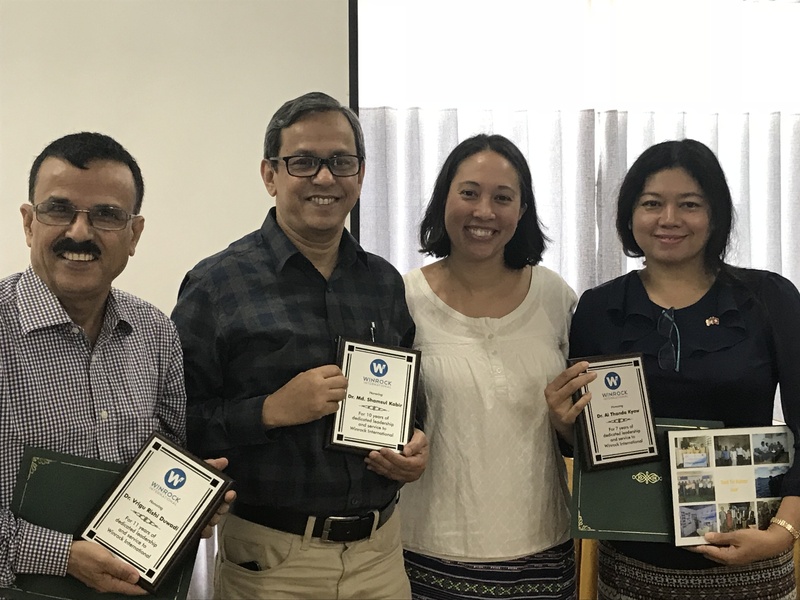 The iDE team in Nepal: Director, Luke Colavito, IPM Coordinator Lalit Sah, and Agriculture Director Komal Pradhan, were great resources for IPM information. Lalit Sah and iDE Regional Manager in Pokhara, Balkrishna Thapa Magar, also joined us and assisted in some of the training sessions. 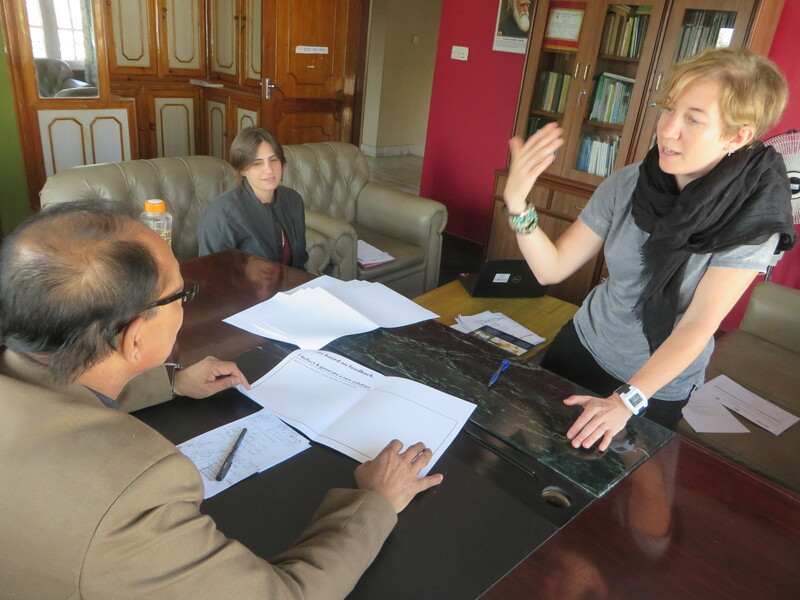 We flew to Pokhara and visited the Nepal Ministry of Agriculture’s Plant Protection Lab. We also visited an Agro-Vet in Pokhara that supplies seeds, fertilizer, and other crop inputs to area farmers. 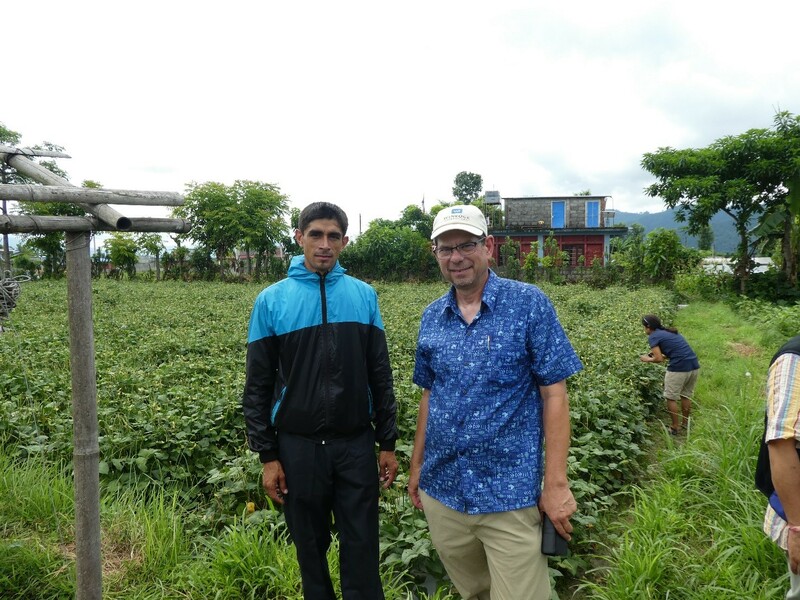 Mr. Bannon with Khyam Paudel at his farm outside Pokhara. 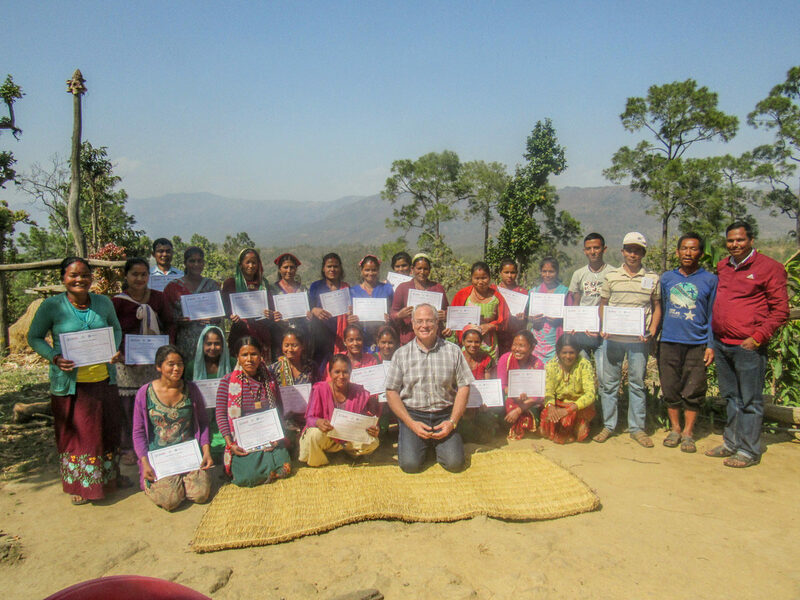 From Pokhara, we conducted four 2-day training sessions in tomato IPM in small villages outside of Pokhara. Again, I was very happy to have Winrock’s driver Krishna safely navigate the mountain roads to the training sites to and from Pokhara. The growers have an excellent market opportunity with tomatoes in the off-season (rainy season) to provide fresh market tomatoes to the tourist city, Pokhara. They grow under plastic tunnels to keep the plants dry to prevent diseases. This is an income opportunity for young farmers to stay in their home villages with a viable business. We asked the growers for inputs on their pest problems and other growing issues in tomatoes. Fortunately, most of the pest management issues were stated in the scope of work, so I was prepared. We discussed management of tomato diseases, such as Late Blight and insect pests like the newly introduced South American Leafminer (Tuta absoluta). A total of 125 growers attended the trainings, over half were woman growers and 58 were youth growers. We also had opportunities to make field visits to some of the growers’ farms. The experience gave me new perspectives in many ways. As a teacher, it was new and interesting to work with a translator to deliver information. 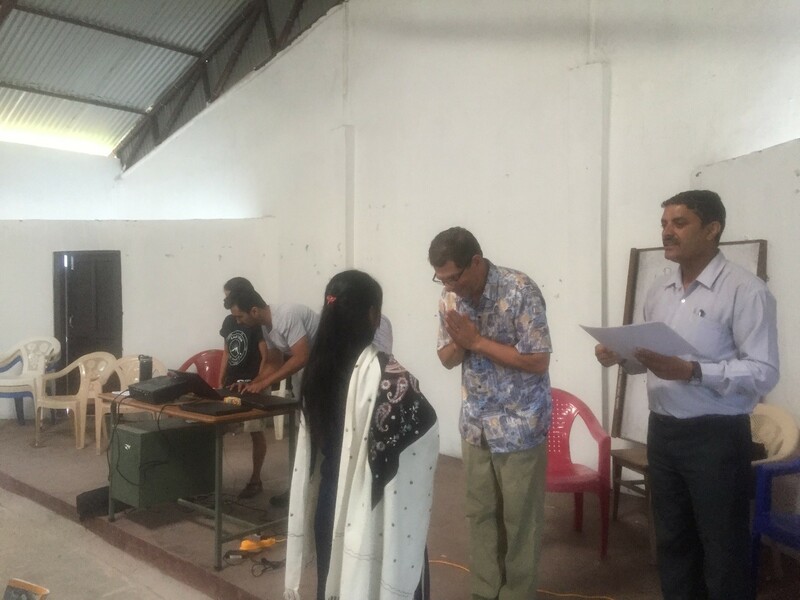 Arun Thapa from Winrock, Lalit Sah and Balkrishna Thapa Magar from iDE, and Sanjaya Timilsina from DCDO all helped with translation. They all have agricultural backgrounds so they were familiar with the subjects and effective in helping the participants to understand the material. We had to be flexible and work around power outages. Having PowerPoint and a projector was not always an option, often we had to resort to drawing boards. It was especially gratifying to have a group of people that were excited to learn about innovative ways to help them grow tomatoes profitably and safely. The growers have a unique opportunity with their tomato market in Pokhara. Being in a profoundly different culture, climate, and economic conditions gave me a new perspective on all the things we take for granted here in the USA. Being able to give my time and knowledge to people who can use it to improve their lives was highly gratifying to me. I felt honored to be able to work with the Nepali growers, the teams from Winrock, DCDO, and iDE. It was also a pleasure to have US Peace Corps volunteers attend the training, many of them have tomato projects in their host communities. I’m hoping that the information presented at the meetings can be utilized by the agency staff and grower cooperatives. I would very much be interested in doing a follow-up project. 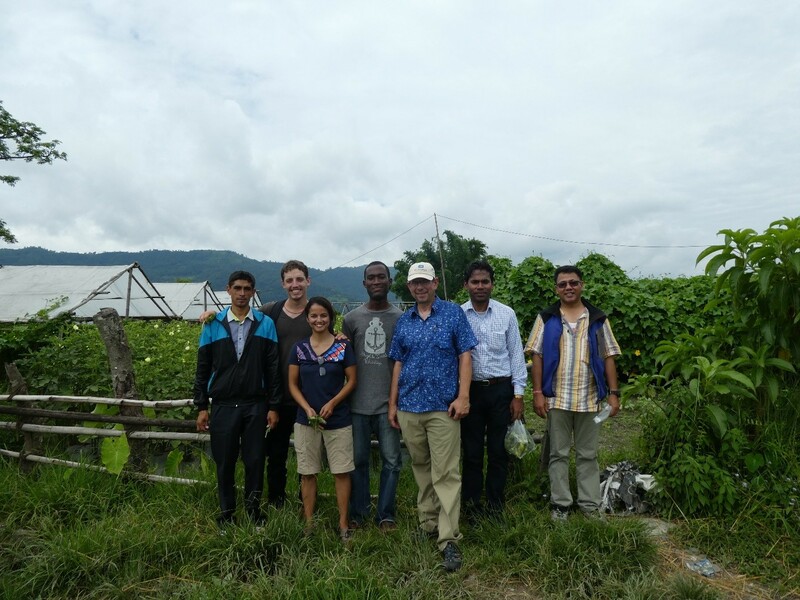 Mr. Bannon with Peace Corps volunteers, iDE staff, and Khyam at Namuna Agro Farm in Pokhara. This experience changes how I approach my work here. It reinforced the importance of teamwork, it helps my tolerance level in dealing with difficult issues here. It makes me feel grateful that I have learned things in my career in agriculture that can help people in another part of the world improve their standards of living. This was my first international experience and I hope to do more in the future.